Today I can proudly announce my first solo exhibition starting on 12th of May 2014 in Cologne, Germany. 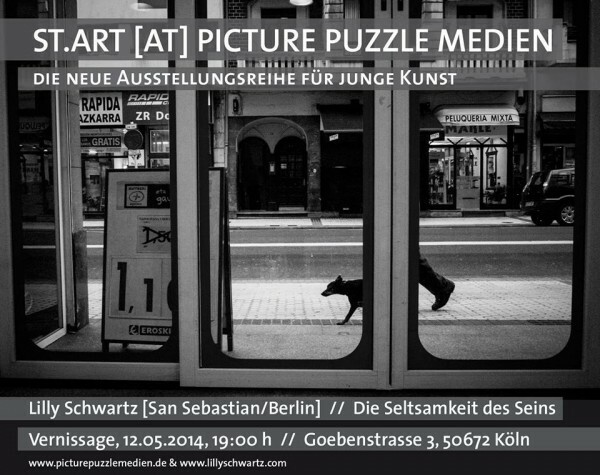 I will be showing a variety of street photographs mostly taken in Berlin and San Sebastian. Among the pictures taken in Berlin will be a selection of pictures from my Down Below project, which documents the encounters with the strange creatures of the Berlin underground. You can also find an announcement in German on the website of Picture Puzzle Medien, the television production company and PR agency kindly supporting my work by organising the exhibition. Vernissage on 12th of May 2014 7pm at Picture Puzzle Medien, Goebenstraße 3, 50672 Cologne, Germany. I would be very glad to see you there! If you stop by, of course don’t be shy and say hello! I guess I’ll be the one with the camera. The exhibition will be running from 12th to 19th of May 2014. Opening times: mo-fri 10am-7pm, weekend upon request. Gratuliere! Viel Spass und viele neue Bekanntschaften wünsche ich. Köln ist etwas zu weit von Hot Springs, Arkansas — sonst wäre ich auch da. Dankeschön, Peter! Schade, dass es zu weit für Dich ist! Congratulations for your exhibition! It will be a great experience and great success! PS: too far from Italy, sorry! Thanks Robert! I can’t wait! Shame that it’s too far for you from Italy. Too far from India! Wish your maiden exhibition a great success !! Thanks Subroto! Shame about the geography of things! Congratulations, Lilly! Wish I could be there. Love the shot. Dankeschön Ralf! Ja, schade, dass es zu weit weg ist!